to whom be everlasting praise and glory, for ever and ever. Amen. The most probable identity of the servant of God in Isaiah 42:1-9 is the people of Israel themselves. They, the Chosen People, have the responsibility to be a light to the nations, or Gentiles. This is a light the subjects of Psalm 2 oppose; the light of God is not a priority for them. Another proposed identity for the servant in Isaiah 42 is the Messiah. This fits well with John 1:1-14 and 1 John 4:9-16. We can also discern from 1 John 4 that faithful Gentiles get to share with Jews and the Messiah in being a light to the nations. The light we are supposed to share is one that places the spotlight on God, not on ourselves. As the Westminster Catechisms state, man’s chief end is to glorify God and to enjoy Him forever. Discipleship entails humility before God. 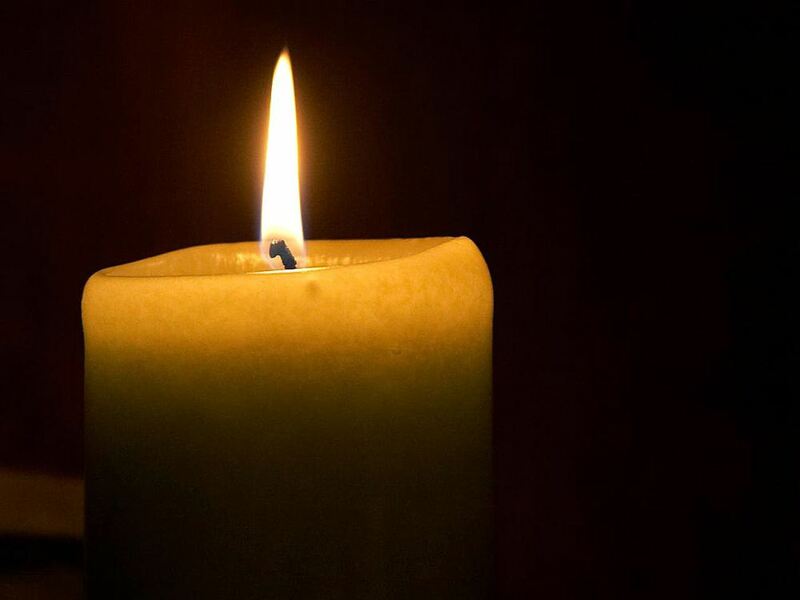 May we shed light on God humbly, unabashedly, and dutifully, by grace. The theme of pregnancy continues for the third consecutive set of pericopes. The warrior-like Yahweh of Isaiah 42 remains loyal to Israel, will redeem it, and “will scream like a woman in labor” (verse 14c, TANAKH: The Holy Scriptures, 1985). 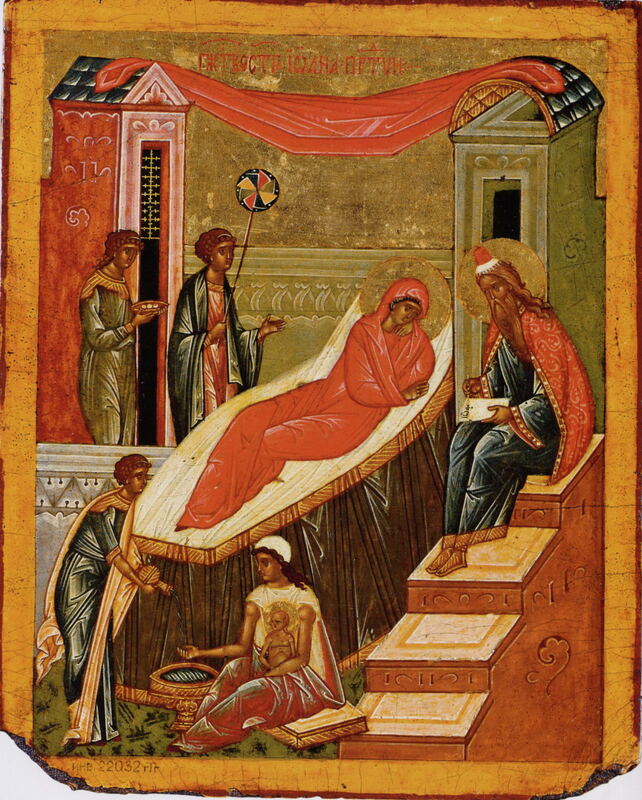 The reading from Luke 1 tells of the conception of St. John the Baptist, the great forerunner of his cousin, Jesus. Once again a barren woman becomes pregnant, losing the disgrace resulting from her childlessness in a patriarchal culture. These are accounts of new life, both physical and spiritual. God, the pericopes tell us, is loyal to certain people on the basis of grace even when they are disloyal to God. (There is doom for others, however.) Is not God due loyalty? Nothing we can offer God can repay for divine grace, but God does not seek repayment. Our responsibility is to trust in God, loving God fully and our fellow human beings as we love ourselves. One way of expressing love for God is loving our neighbors. This is a devotion for a day in the vicinity of December 25, Christmas Day. 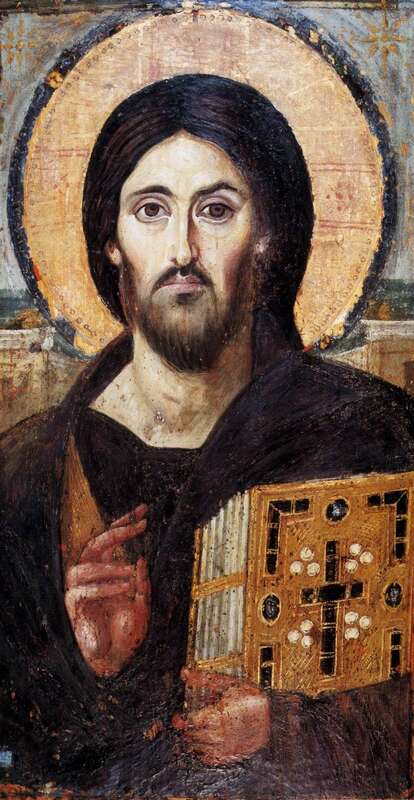 In Jesus, the author of the Gospel of John tells us, the Word (or Logos) of God “became flesh and lived among us” (1:14a, The New Revised Standard Version, 1989). Yet Jesus met with rejection (1:11). That rejection was an example of disloyalty to God. May Christmas become for you, O reader, an occasion to renew your loyalty to God in Christ. May the season of Christmas be twelve days of spiritual renewal as you celebrate the birth of Jesus. Throughout, the revisers have striven to maintain the high standards and noble ideals handed down in the worship-song of the Moravian Church. This post stands in lineage with the Preface and Parts I, II, and III. With this post I enter the phase of this series in which I operate almost entirely from hardcopy sources. This reality appeals to me, for I relate better to a book than to a PDF file of a book. I prefer paper to a screen any day. And I can open two books and compare them side-by-side more easily than I can compare pages on PDF files on the same computer. The Moravian Church in America published two major liturgical books-hymnals–in 1923 and 1969–and two youth hymnals-songbooks during the span of time this post covers. The two provinces usually succeeded in balancing quality of texts and music on one hand and cultural popularity of style on the other. Perhaps the best way to commence an analysis of the Hymnal and Liturgies of the Moravian Church (Unitas Fratrum) (1923) is with its appearance. The gold-embossed letters in an ornate font set against a black cover proclaim a strong sense of reverence for God and the worship thereof. Fortunately, most of the content is consistent with the formality of the external font. Unfortunately, some of the content is inconsistent with the formality of the external font. The Lord’s Supper service permits the use of individual cups. The Communion for the Sick has become the Private Celebration of the Lord’s Supper. Language in some rituals indicates the influence of the American Standard Version of the Bible (1901). The new Special Services section includes four new services: Missionary, Patriotic, For Schools and Colleges, and the Office for the Service Preparatory to the Holy Communion. There is a second rite for the Burial of the Dead. The Liturgical Service in Memory of the Martyrs has become the rite for All Saints’ Day. The service for a Day of Humiliation and Prayer has departed the Services for the Church Seasons section for the new Special Services section. The Communion Liturgies section has become the Communion Hymns section. A bruised reed shall He not break, and the smoking flax shall He not quench; He shall bring forth judgment unto truth. Watch graciously over all governments; establish them in truth and righteousness, and give them thoughts of peace. Bless the President of the United States and both Houses of Congress; the Governor and Legislature of this Commonwealth, and all others that are in authority; and grant us to lead under them a quiet and a peaceable life in all godliness and honesty. Teach us to submit ourselves to every ordinance of man for Thy sake; and to seek the peace of the places where we dwell. Give prosperity, O God, to this land, and salvation to all its people. Bless the President of the United States and both Houses of Congress, the Governor and Legislature of this Commonwealth, and all others that are in authority. Protect them from violence, and fill the hearts of the people with reverence and love for those who, as the ministers of God, have been set for the punishment of evil-doers and the praise of them that do well. Raise up for us shepherds that shall perform Thy pleasure, who, in patience and fortitude, shall stay themselves upon their God. 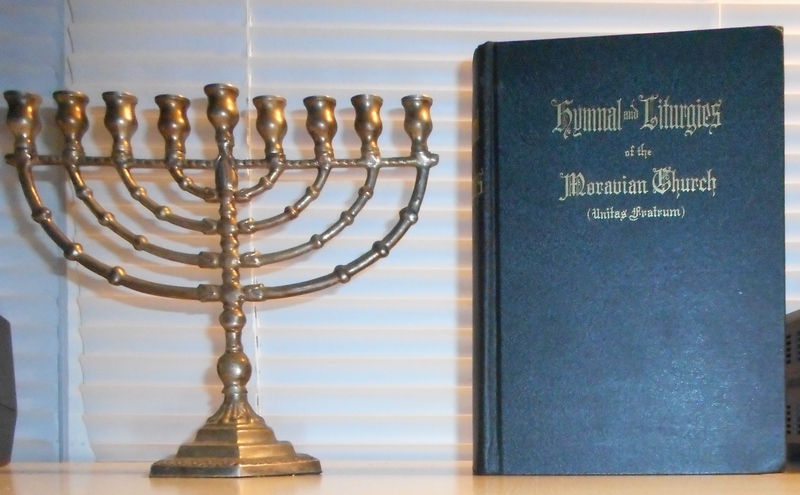 The Hymnal and Liturgies (1923) includes a lectionary table, a list of the festivals of the church year, 25 chants and responses, 952 hymns, and several indices. The topically arranged hymns include a healthy representation of the output of Moravian authors, translators, and composers as well as products from ecumenical hymnody. The hymns range from the old to the more recent, “recent” meaning the author, translator, or composer was alive in 1923. Most of the hymn content of the book, however, comes from people who died before that year. And the quality of texts ranges from John Mason Neale (1818-1866) translations of Greek and Latin hymns on the high end to Frances Jane Van Alstyne (Fanny J. Crosby) (1820-1915) hymns on the low end, with “Jesus Loves Me, This I Know” occupying room in the middle (closer to Crosby than to Neale). The format of the hymn section is old-fashioned by contemporary standards. The musical systems contain the first verse only, so the other verses fill space below the systems. This is a format consistent with practice of the time. I have identified it in other volumes dating from 1895 to 1918 in my collection. I have also noticed a different format–placing more or all verses inside the systems–in denominational hymnals as early as 1918. It is a lamentable fact that the Christian churches of America have been slow in giving their young people the best in sacred music. Many testify to the fact that they find better music in their public schools than in their churches and church-schools. The various denominations have been moving to raise the quality of church-school music. With this hymnal, the Moravian Church makes its contribution to a great cause. The First Edition opens with 219 hymns, arranged topically. All the verses are inside the musical systems, unlike the arrangement in the Hymnal and Liturgies (1923). The selection of hymns indicates a classical bias, of which I approve. They range from antiquity (Clement of Alexandria, who lived from 170 to 220 C.E.) to the twentieth century, with Henry Van Dyke‘s masterpiece, “Joyful, Joyful, We Adore Thee,” set to a tune arranged from Ludwig von Beethoven‘s Symphony #9. Also, “Jesus Loves Me! This I Know,” present in the Hymnal and Liturgies (1923), is absent from the Moravian Youth Hymnal. The classical bias is also evident in the Orders of Worship. The first Order of Worship opens with either “Morning” from Edvard Grieg‘s Peer Gynt or a hymn, “Light of the World, We Hail Thee.” The hymnal impresses me. A Service for the Out-of-Doors. Order of Worship XIII, the patriotic service, includes the troublesome prayer about submitting “ourselves to every ordinance of man” for God’s sake, unfortunately. I have too much of a rebellious tendency in my thinking to consent to that sentiment. The Preface to the Second Edition states that the hymn section remains unaltered and that the Orders of Worship have undergone extensive revision. The 1961 version of the Moravian Youth Hymnal also contains hymns #220 (Christian Gregor‘s Hosanna of 1783) and #221 (Francis Florentine Hagen‘s Morning Star). The Aids to Worship section has five categories–the six from 1942 minus Prayers. 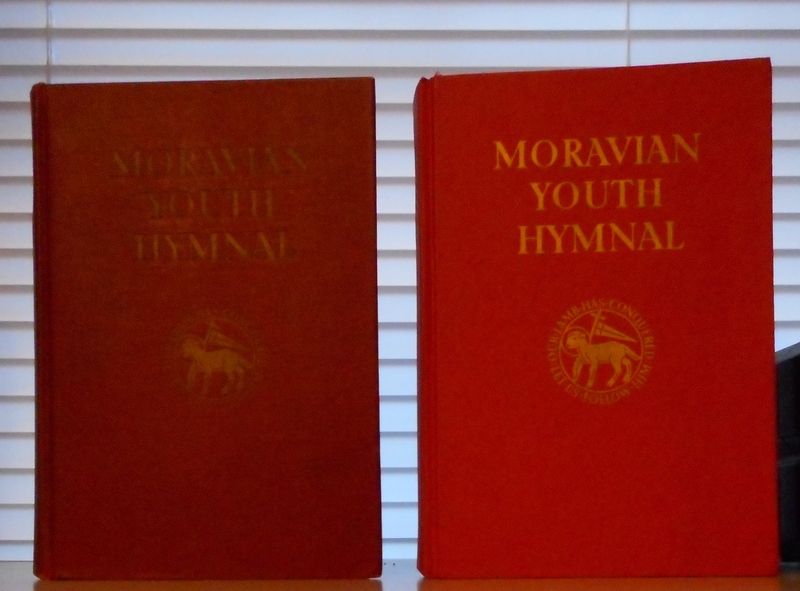 I know from Internet searches that the Moravian Youth Hymnal remained in print at least as late as 1966. Moravian Fellowship Songs is a volume considerably less illustrious than the Moravian Youth Hymnal. The slim paperback (96 pages, to be precise) offers no publication date, but my review of internal evidence (copyright notices on songs) indicates that the American Moravian Youth Fellowship published the book no earlier than 1954. The range of quality of the 112 songs ranges from the abysmal to the excellent. Classics of hymnody rub shoulders with “This Old Man” and “Hiking Song.” Between those two extremes reside rounds and spirituals, far from my favorite genres. (I am a European classicist. Brian Wren takes this attitude to task in Praying Twice: The Music and Words of Congregational Song, 2000. It is an expression of classism, he writes in disapproval. Nevertheless, I remain an ardent European classicist.) Forms for a communion service and a lovefeast fill the back of the book, which ends with an index and a list of fun songs. 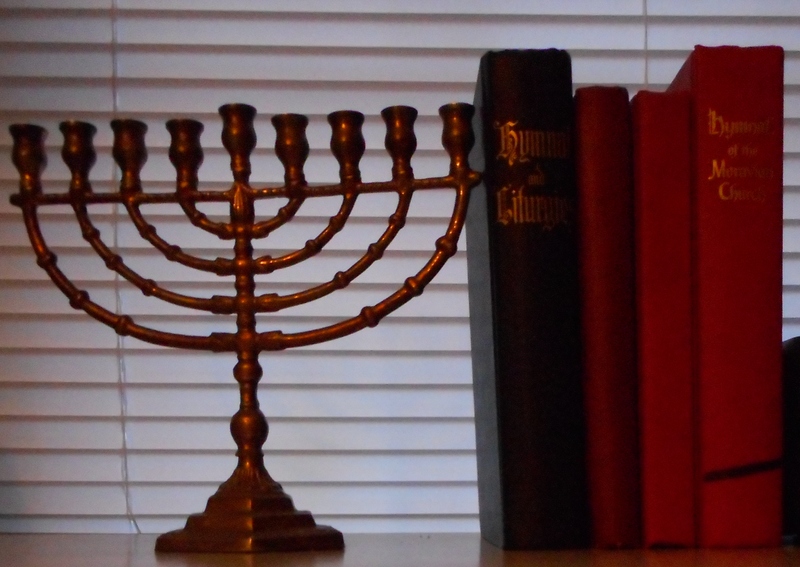 The final volume I analyze in this post is the Hymnal and Liturgies of the Moravian Church (1969), the one with a cross and a chalice on the red front cover. My copy of the Hymnal and Liturgies (1969) is thicker than my copy of its 1923 predecessor despite the fact that the 1969 book contains 358 fewer hymns than the Hymnal and Liturgies (1923). The 1923 volume offers 952 hymns and 25 chants and responses, but its immediate successor contains 594 hymns and 29 chants and responses. Another difference is that the Hymnal and Liturgies (1969) offers a more ecumenical hymnody than does its immediate predecessor. The selection in the 1969 volume is more contemporary relative to its publication date and contains more folk and gospel hymns than does the Hymnal and Liturgies (1923). The Liturgy of 1923 contains two General Liturgies, I and II. The Liturgy of 1969, however, contains four, the Liturgies of Confession, Trust, Adoration, and Covenanting. The version of the Church Litany in the Hymnal and Liturgies (1969) is abbreviated and revised to remove duplications. The Liturgy of 1969 merges the Liturgical Services for the Church Seasons section and the Special Services section from 1923 into the Church Year and Special Occasions section. The Communion Hymns section has become the Holy Communion section. The preparatory service for the Lord’s Supper, located in the Special Services section in 1923, has moved to the Holy Communion section. The Liturgy of 1969 merges the services for Pentecost and August Thirteenth. The Liturgy of 1969, debuting on the cusp of great change in the language of worship and in the calendar of much of Western Christianity, retained old-fashioned pronouns (Thee, Thy, et cetera) and the old calendar, complete with Septuagesima, Sexagesima, Quinquagesima, and Sundays after Trinity. (The revised Roman Catholic calendar and lectionary, which influenced much of Protestantism and Anglicanism, became effective on the First Sunday of Advent, 1969. The -gesimas were gone and Sundays after Pentecost replaced Sundays after Trinity.) These facts, combined with the rapidly changing hymnody of the 1970s (not to mention the 1980s), rendered the Hymnal and Liturgies (1969) outdated when it was young. The volume was not unique in this regard; I can name other books of the same genre and generation (about 1965-1973) to which that statement applies. Many of them were excellent books of greater quality than then-contemporary, Low Church Evangelical resources. And, as much as I pray to God as “You,” not “Thee,” I would rather sing out of the Hymnal and Liturgies (1969) than out of non-denominational Evangelical hymn books such as Hymns for the Living Church (1974), Hymns for the Family of God (1976), and The New Church Hymnal (1976). As usual with Moravian hymnals, the indexing is thorough. Also, the biographical notes in one index are quite helpful. The Moravian Book of Worship (1995) replaced the Hymnal and Liturgies (1969). 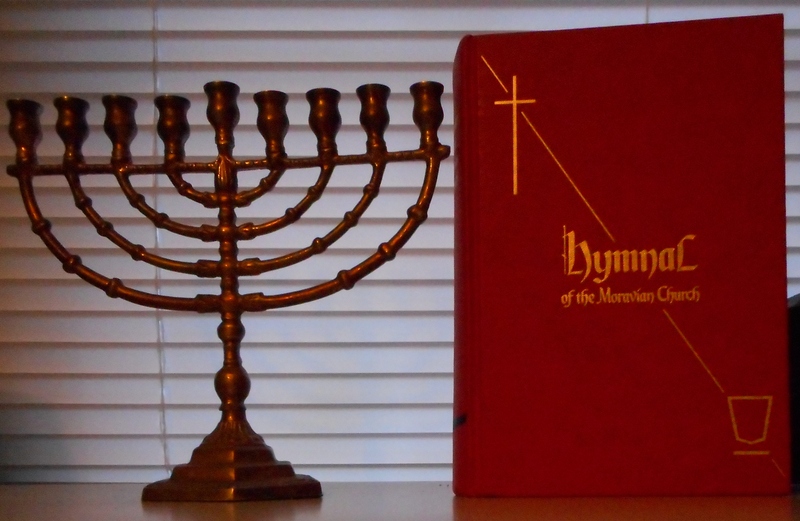 Just as use of the Hymnal and Liturgies (1923) continued after 1969, use of the Hymnal and Liturgies (1969) persists. (I have found evidence of this on congregational websites.) The increasing diversity of the Moravian Church in America, fed in large part by immigration, has led to more variety in worship and song styles. Official and unofficial Moravian Church publications I have read accept, if not praise, this change. I, however, remain a staid Episcopalian and an unapologetic European classicist. I know what I like, and old Moravian hymnals approach that ideal more often than contemporary ones do. The Book of Common Worship: Provisional Services and Lectionary for the Christian Year. Philadelphia, PA: Westminster Press, 1966. The Book of Worship for Church and Home; With Orders of Worship, Services for the Administration of Sacraments, and Aids to Worship According to the Usages of The Methodist Church. Nashville, TN: Methodist Publishing House, 1965. Burcaw, Robert T., ed. The Moravian Book of Worship Manual for Worship Planners. Bethlehem, PA: Interprovincial Board of Publications and Communications, 1995. The Covenant Hymnal. Chicago, IL: Covenant Press, 1973. Holy Women, Holy Men: Celebrating the Saints. New York, NY: Church Publishing, 2010. The Hymn Book of the Anglican Church of Canada and the United Church of Canada. 1971. The Hymnal. Philadelphia, PA: Presbyterian Board of Publication and Sabbath-School Work, 1895. The Hymnal. Philadelphia, PA: Presbyterian Board of Publication and Sabbath-School Work, 1911. The Hymnal. New York, NY: Oxford University Press, 1918. The Hymnal with the Supplement of 1917. Philadelphia, PA: Presbyterian Board of Publication and Sabbath-School Work, 1917. Hymnbook for Christian Worship. St. Louis, MO: Bethany Press, 1970. Hymns for the Family of God. Nashville, TN: Paragon Associates, 1976. Hymns for the Living Church. Carol Stream, IL: Hope Publishing Company, 1974. The Liturgy of the Reformed Church in America Together with the Psalter Selected and Arranged for Responsive Reading. Gerrit T. Vander Lugt, Ed. New York, NY: Board of Education, 1968. The Methodist Hymnal. New York: Eaton & Mains, 1905. The Methodist Hymnal: Official Hymnal of The Methodist Church. Nashville, TN: Methodist Publishing House, 1966. Moravian Book of Worship. Bethlehem, PA: Moravian Church in America, 1995. Moravian Youth Hymnal. Bethlehem, PA: Interprovincial Board of Christian Education, 1942. Moravian Youth Hymnal. Bethlehem, PA: Interprovincial Board of Christian Education, 1961. The New Church Hymnal. Lexicon Music, 1976. The New Psalms and Hymns. Richmond, VA: Presbyterian Committee of Publication, 1901. The Pilgrim Hymnal with Responsive Readings. New York, NY: Pilgrim Press, 1904. The Pilgrim Hymnal with Responsive Readings and Other Aids to Worship. Boston, MA: Pilgrim Press, 1912. Worship in Song Hymnal. Kansas City, MO: Lillenas Publishing Company, 1972. The Worshipbook–Services and Hymns. Philadelphia, PA: Westminster Press, 1972. Wren, Brian. Praying Twice: The Music and Words of Congregational Song. Louisville, KY: Westminster John Knox Press, 2000.